This is the last of my 25th anniversary posts. It is also my most self-indulgent. Forgive me. 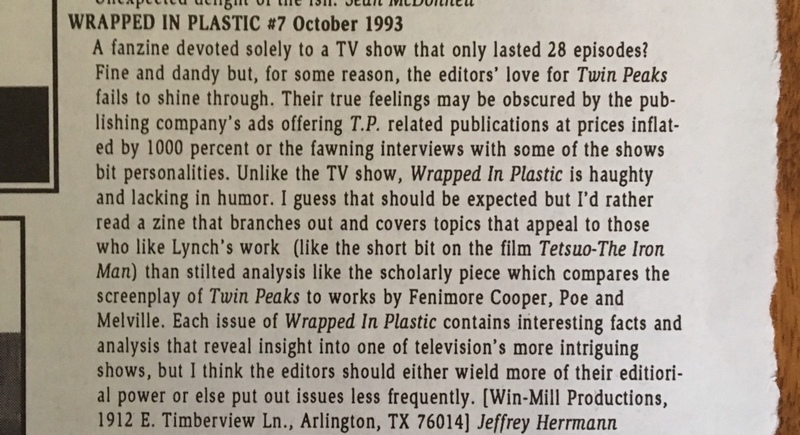 As Twin Peaks faded into history, Wrapped In Plastic was often acknowledged as being a stalwart reminder of the lasting impact of the series. 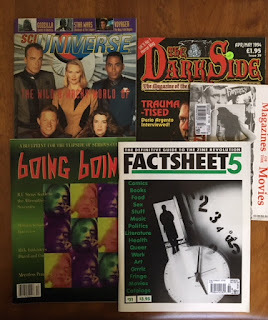 Over the years, a number of media outlets either reviewed Wrapped In Plastic or interviewed Craig Miller and myself about how (and why) we were still making a magazine about a show that had been cancelled after a mere 30 episodes. Wrapped In Plastic was a curiosity and it became a good human-interest topic. WIP started to get attention in small-press magazines and fanzines. 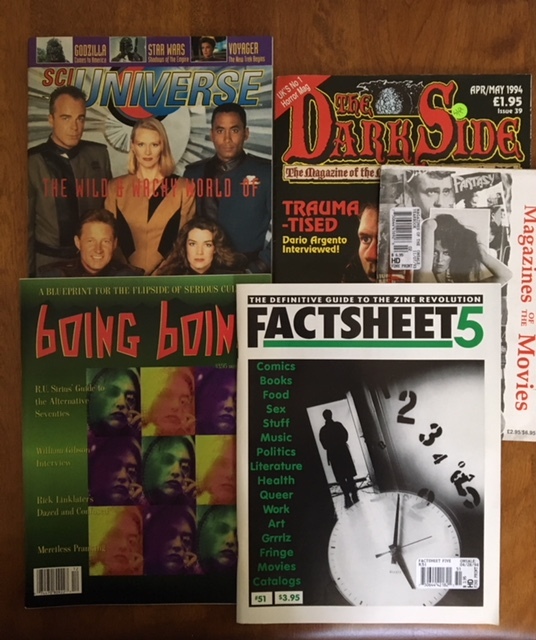 Before the internet a plethora of publications reviewed all manner of obscure media. Factsheet Five was the most famous of these and it was an honor to be included in their fanzine review. We were also reviewed in dozens of other small press mags, and, honestly, the reviews were usually pretty good. A few of the magazines that reviewed WIP. But not always. Here's one that says "the editors' love for Twin Peaks fails to shine through." (We were also "fawning" in our interviews and "haughty"!) Believe it or not, this reviewer wanted us to publish WIP less frequently! Accused of 'stilted analysis' by a magazine called Your Flesh. After this published I became a huge fan of Patrick O'Brian. Really. A few years passed and, at last, plans were being made to release Twin Peaks on DVD. Artisan, the company behind the discs, asked us to help put the release together. One of the biggest articles about Wrapped In Plastic appeared in a 1999 issue of Texas Monthly. Pamela Colloff spent many hours talking to Craig and me on the phone and in-person. It was a really great article and a high-point for coverage of WIP. A few years later, Wrapped In Plastic finally ceased publication. Video Watchdog wrote a very nice obituary and that was the end of interest in the magazine. 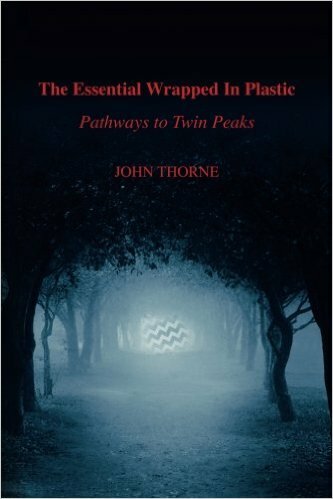 After the October 2014 announcement that Twin Peaks was returning to television, I started to get calls about Wrapped In Plastic again. Jeff Jensen at Entertainment Weekly spoke with me for some time and wrote a long piece about the history of the magazine. And Showtime also had some interest. They wanted me to talk about Twin Peaks and Wrapped In Plastic for their Twin Peaks Phenomenon documentary. It was a huge thrill to go to New York and contribute to their promo. Wrapped In Plastic was featured prominently. So that's it. 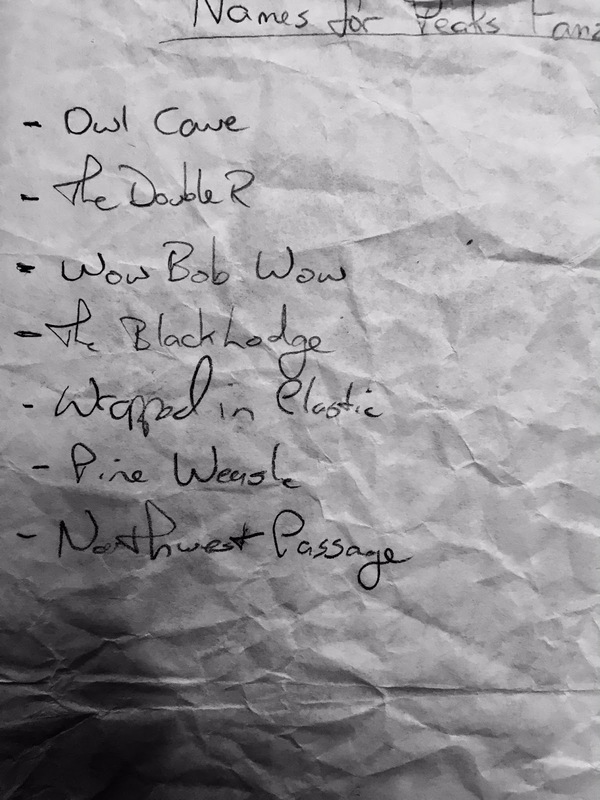 Wrapped In Plastic has a (very) small place in the history of Twin Peaks. Twenty-five years later a few still remember what Craig Miller and I did over 75 issues. I feel very good about what we accomplished. We didn't do it for money (ha!) or notoriety. We did it because we loved Twin Peaks. Thanks for allowing me some time to reminisce. It was fun. This guy has got to stop talking. We got letters from many different countries. I can remember getting some from South Africa, Israel, Australia. 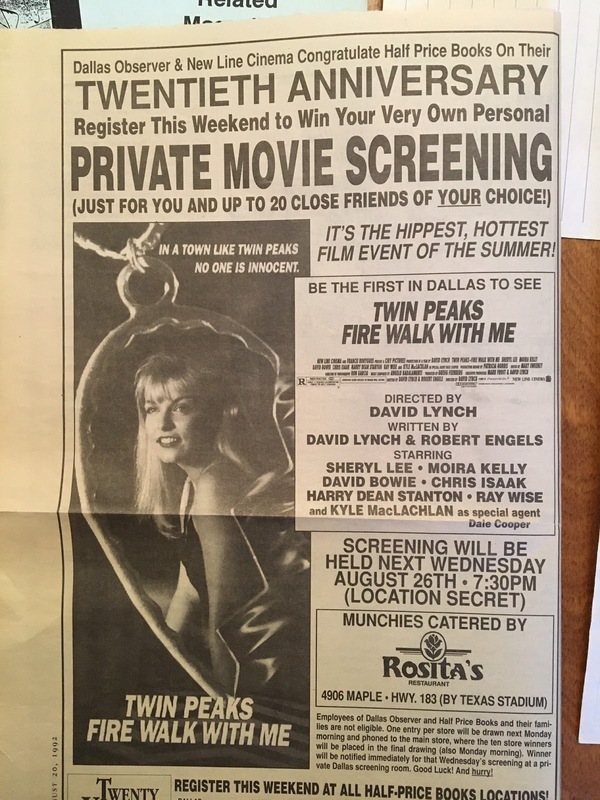 It was exciting to realize we were reaching Twin Peaks fans all over the world! Here’s a sample of some fun or interesting letters from Wrapped In Plastic. This is but a tiny portion; there are probably enough letters in the 75 issues of WIP to make a book! WIP 6 (Aug 1993): Some interesting theories and predictions from decades ago. I hope any future films of Twin Peaks will be done for television. If the networks don't want it, then have it in syndication. FWWM could have been done for television just as well, maybe better. Twin Peaks was born on television; it should stay on television so everyone can see it at the same time and then start analyzing the tape. That's the way it should be. It would be nice if it could come back as a weekly series, even if some parts have to be replaced. I would love to see that third season. I just received WIP, and after reading it I felt like seeing FWWM again. I must say that upon second viewing it appeared to be a stronger film than I had remembered. Do you have any thoughts on the significance that clocks and time played in the film? Toward the beginning of the film, Chet Desmond, speaking to Sheriff Cable, said, "We keep our own clock." Shortly after this, the first of many shots of various clocks is shown. Clocks appear throughout the film and Desmond plays a little joke on Stanley by asking him what time it is. And on Laura's last day we see the shot of the clock that runs out of control while accompanied by the song, "Moving Through Time." I pondered the role that time may have played in the film, but I couldn't come up with any strong theories. Any thoughts? 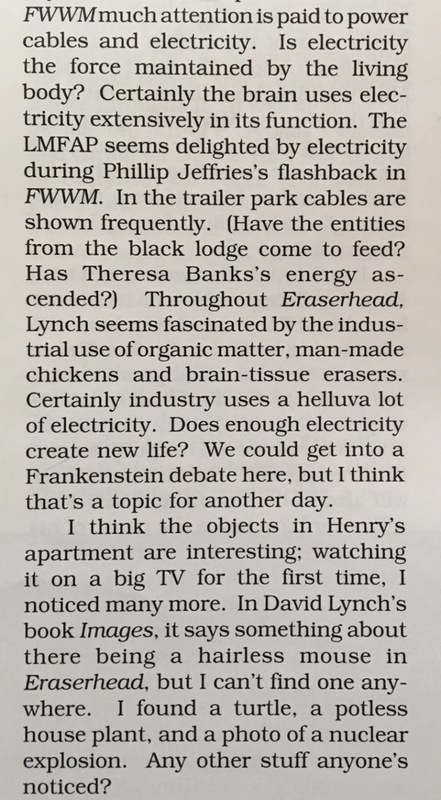 Here's a fun letter from an enthusiastic Twin Peaks fan. I wonder what he is doing today? I need to clarify this thing about a monkey in FWWM. Throughout the Twin Peaks series and movie, one point has always come up: "The owls are not what they seem." The owls! It's not a monkey, but an owl close up and eating creamed corn. The owls are BOB and his followers. Look under your nose, and you will see that I am right. The owls have been watching Laura, Cooper, and all the other characters throughout the series, books, and movie. I hope the WIP team sees what I see, because I don't want to hear about monkeys any more. They're owls! Sheriff Truman said to Cooper in episode three that there is some kind of darkness in the woods, and that they take many forms (as spirits and owls). Hope you get the message! WIP 9 (February 1994): Some people didn't like articles. Some people didn't like interviews. And some people didn't like covers. Just read WIP 8. First let's start with the cover. WIP cannot be accused of predictable "formula" when it comes to magazine covers. 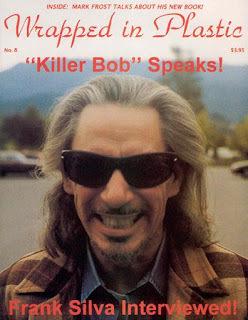 That is without a doubt the most tacky, unflattering photo of Frank Silva I have seen. Thought you'd like some feedback. Nice illustration of Bob on page 1, though. Your complaints about The X-Files being "notorious for sucker-punching the viewer with unfinished stories and dangling subplots" puzzled me. These are a bad thing in XF, but they are okay in Twin Peaks? Let's face it, TP has a lot of unfinished stories and dangling subplots, and I have yet to see you criticize it for this in the same harshness and consistency that you do for XF. Instead you praise TP and declare it one of the greatest series ever. TP's producers and writers had opportunities to wrap up all of the stories. They had to know their show was in danger of being cancelled, and they could have resolved everything, but they didn't. Then a movie was made. They could have wrapped up everything in that, but they didn't. You watch XF and declare that "Mulder's fate [from the second season finale] must be shown." What about Twin Peaks and Cooper's? WIP 47 (June 2000): Here's a good one. "It's Twin Peaks, man!" Ten years ago I was finishing the first year of teacher training in a small New England college. 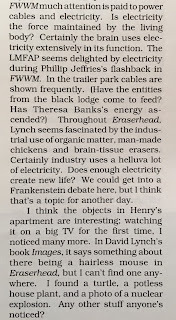 The spring of that year, there was a buzz going through my dormitory about a new television series called Twin Peaks. Between work and study and a general disinterest in television, I never watched the first episodes. That was until the night I walked into the lounge from the campus library at the very end of the first season finale. I entered just as Cooper opened the door to his room. I saw the gun barrel at the same time he did and felt those same three shots to the stomach. As the screen went black and his body hit the floor, I remember being paralyzed, completely transfixed and unmoved, and all I could say was, "What is this?" over the awed shouts and screams of disappointment the small legion of watchers in my dormitory were experiencing. "It's Twin Peaks, man!" the resident assistant told me. And right at that moment, on that very spot, in what can only be compared to a religious experience (I'm sure many fans know the feeling all too well), I was hooked. Ten years later, as a teacher in a Tibetan refugee settlement in Northern India, I still have a serious disinterest in television, but am as in awe of Twin Peaks as I was in those last thirty seconds of the first season finale. Experiencing Tibetan Buddhism here on a day-to-day basis, my mind reels at the similarities to Cooper and the series. I hope this will be an angle pursued sometime within these very pages. For now, I remain honored to have caught Twin Peaks ten years ago, like a comet hurtling through space for a brief instant, or ducks on a pond, or a wonderfully strange dream. 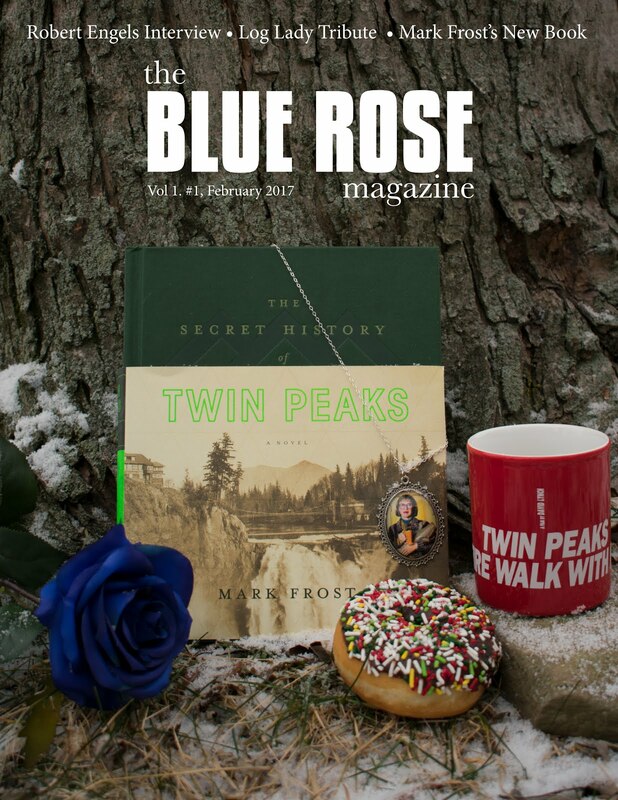 February marked Laura Palmer's sad anniversary. Who really is Laura Palmer? Everything or nothing, the essence of mystery and transcendentalism. The people of the town are broken-hearted and yet their lives go on, as if Laura somehow reincarnated in all of them. Now that I think about it, Laura never really dies but always resurfaces in Donna or Madeleine Ferguson, for example. When Donna visits James in jail there certainly is something very different about her, the attitude especially. Also, notice how Nadine all undergoes a major change as if she were in high school. Unfortunately, like all martyrs, Laura has to die in order to be reborn. She died in the body which caused her anguish and pain only to seek redemption. Who can forget the triumphant smile and tears when Cooper, also a sacrificial lamb of sorts, is sitting with her in the waiting room, opening the door to paradise? Cooper and Laura's fate have been sealed, not in this world but in another time dimension. Cooper sees her in his dream, in Glastonbury Grove and finally in the end. The mystery will never be fully solved. Lynch's spectacular scenarios (I don't see why critics dissed Fire Walk With Me) are picture perfect. The many Laura's coincide with our own multiplicity, the shivic cosmic dance of death and rebirth. Wonderful, thought-provoking article on Twin Peaks's final episode. As a pianist/composer, I have been fascinated for many years by sacred and secular hand gestures throughout the world. Whether intended or not by Mr. Lynch, Laura Palmer's hand gesture in the Red Room is identical with a common "mudra," or symbolic hand gesture, found in Buddhist sculpture called "semui-in" (in Japanese), "shih-wu-wei-yin" (in Chinese), and "abhayamudra" or "abhayamdadamudra" (in Sanskrit). It is used in meditations to create the absence of fear and is similar to the teaching mudra, "an-i-in" except that Laura’s left hand would have to be turned outward and somewhat down. I reject it. I reject it because I don't feel any need for it. The first thirty minutes of Fire Walk With Me are probably my favorite half hour in any film, and accepting your take on it would honestly spoil the magic for me. Taken as "reality," I find the prologue to be mysterious, incredibly intriguing, and a whole lot of fun. I actively enjoy trying to piece together all my little theories about how the supernatural elements "work." After finishing your essay, I sat and thought about the prologue as a dream, and the whole film suddenly seemed less interesting to me. It felt like a cop out. So my own search for answers will continue. That's it for now. There's more WIP 25th Anniversary celebration to come. Stay tuned. October 2017 marks the 25th anniversary of Wrapped In Plastic magazine. Issue 1 went on sale in comic stores across the country on October 14, 1992. Over the next 13 years, Craig Miller and I published 75 issues of WIP. By the end of the run we calculated we had printed roughly one million words about Twin Peaks, David Lynch, Mark Frost and other associated films, TV shows and artists. This month I’m walking down memory lane, publishing a few short blog entries about WIP. There’s nothing weighty here. Nothing that will mean much to others. But indulge me, if you will. This is my online scrapbook and I’m going to reminisce about Wrapped in Plastic and celebrate a few of my favorite moments. 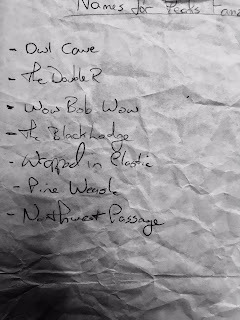 It would take us over a year to actually make it happen, but in 1991 I was so gung-ho after meeting Craig that I sat down to make a list of possible magazine titles. 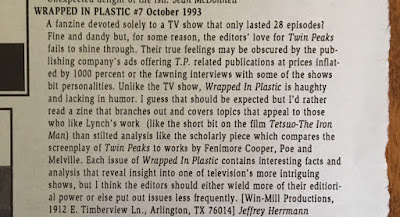 Wrapped In Plastic was always my favorite (it was a phrase recognizable to Twin Peaks fans but also a title that might evoke curiosity in the casual magazine buyer, anything to get a potential customer to take a look.) I think my second choice would have been, Wow Bob Wow. After a year of on-and-off-again plans (we tried to get a license to use Twin Peaks in the title but the cost was too prohibitive) Craig and I started work on issue 1 in the summer of 1992. 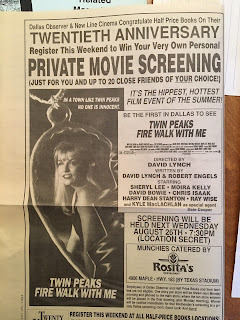 Around that time, I had been lucky enough to win a private screening of Fire Walk With Me (long story) and that was a real motivator to get the first issue into production. We wrote a review of Fire Walk With Me. It was an embarrassingly amateurish review but that’s how you get started, just jump right in. We’d get better at analyzing the film as we returned to it “time and time again” over the next decade (in issues 34, 60 and 71, in particular). 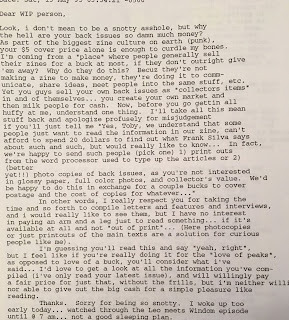 Issue one was fun but it really was a “fanzine.” We were only starting to find our way. We were happy with issue one. We printed up advertisements about it to distribute at comic conventions. It was the best way to spread the word in the pre-internet days. We started work right away on issue 2, which was a much better issue. And then we started to receive letters, LOTS of letters. I’ll talk about some of those in a future post.